Almost official, so I'll put it up here. Lots of good stuff that I've done but lots of 36 year old problems too. This is just to get anyone thinking about it getting serious. Sitting in her tonight thinking someone will be doing the same for $4G or so makes me want to find a good match. Danny perhaps my experience will help someone decide to buy your Euro, I bought mine for 2k (it sat around unused for at least 2 years) and have very close to 6k in it now, and to get it where I want it, perhaps another 2k. Plus maybe 350 hours, but I am 73 so a bit slow. You are offering a good deal. Hay Danny your Photobucket link doesn't work. Hopefully he will have the "new" 79 27 ft Barth. It should be the new 79. 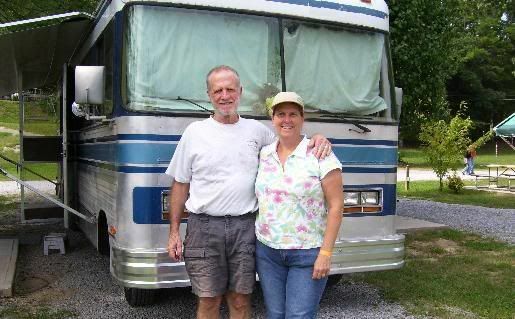 Suzie and I are already planning making it our own but nothing that should keep it off the road. And Sammi of course. The Euro is officially for sale, but I have a few things to do before I let it go, #1 being installing the new holding tank. 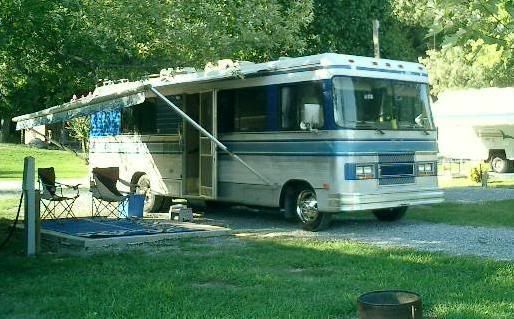 I wish I could say this is a cherry old RV but I kinda like to be honest and it really is pretty rough around the edges. The interior is very nice, no mildew or odors or anything like that, but the windshield drips a bit when it really rains hard. The 1" tubing on the underside is rusted pretty bad, as is the wheel wells and pretty much everything made of steel down there. The suspension is only OK. I thought it was good until I drove our new one, but now I know what can be done. I never could figure out how to stop that damn vapor lock, but the 454 runs strong beside that and burns no oil. I got 8. 3 MPG the last couple times I checked it using Interstate milemarkers. The speedO doesn't work, never has since I owned it and I don't know why. The tires are off the new one and look great but are older than most people on this site think they should be. The awning is very good, and works flawlessly. The Onan 5000 starts from the inside or out and runs great, and will run the roof air, which is about 8 years old. The fridge is also about 8 years old, 110 and propane works fine. The toilet is a high Thetford, but currently dumps onto the road, but that will be fixed. To be as honest as I can, this coach would make a great hunting cabin, or if you're as talented and driven as Richard, it could be restored to a fine coach. When I get the new holding tank in and have everything up to snuff I'm going to put it out there for $4500. Seems to solve the vapor lock problem. Geez I just read that link about fuel injection, I really think a TBI is the way to go, but I have no idea what that guy said, SteveVW please read that post and S'plain to me!!!! Thought I'd bring this up again. Haven't really done anything yet but I'll be getting at the holding tank installation now that I have a little time. I fired up the engine and the genny for some lookers the other day and they ran very well. How far did the lookers run? Just about done installing the new holding tank. Today will be spent putting some more gas in her so the genny will run, and cleaning up. Had 2 more lookers yesterday. Niether had ever heard of Barth so they thought my price was a little high for an 81 until they stepped inside. One thing they both asked was if I'd consider selling the 79 instead! Sitting next to each other the 79 really looks a lot nicer. No interest from anybody here so next week I'll put it on Craigs and see what happens. Good point on the 79, Danny. It will surely spoil them! Good luck with the sale. Hope to see you again this spring. Hope it sells quickly. I think your price is more than fair.